Meet Nancy, a new client of mine. She wears many hats. She manages a support team, coordinates and defines work for the software development team, and works on many internal improvement projects. Oh, and she’s constantly interrupted by a barrage of emails, phone calls and in person visits, making it a challenge to get anything done. Her days are long, and it’s common for her to sit at her computer on weekends, just to try and keep up. Stress is affecting her health. On top of it all, she rarely finds time for the work she really wants to do. Life is tiring. We can all relate to Nancy in some way. And here’s the thing. What she did is simple, straightforward, and does not demand a lot of time. What she did was follow 5 essential steps that emerged from my work with hundreds of individuals getting started with Personal Kanban™, the most effective tool I know to manage work and navigate life. Today I’ll introduce you to the first step, through Nancy’s journey. Read how she learned to make better decisions about her work, and have fewer 3 am jump out of bed freak out moments. Learn how to apply it to your own situation right away. Tools like ToDo lists, email and calendars don’t help us see the full picture. When we don’t understand all of our options, we feel anxious and stressed that we’re forgetting something, and from not fully knowing just how much stuff there is to manage. Options are all of the possible work items that may be chosen to be worked on. I prefer the word Options instead of To Do to emphasize that not everything here has to be done. Context changes all the time, we don’t have to feel obligated to do something just because we’ve added it to our list. Doing are all of the work items she’s already invested time in. It doesn’t mean she’s working on it right now. If Nancy started on a report 3 days ago, that report is in the Doing column until it’s finished. Waiting On is a subset of Doing, holding any item that Nancy can’t work on until something else happens. Waiting for someone to provide feedback on a report is an example. Done contains all of Nancy’s accomplishments, everything completed, the place where she can celebrate what’s she done and learn more about the nature of her work. This board design satisfies the majority of people – start with it. Visualize what matters most. We then figured out what she needed to see most about her work. Since Nancy wears many hats, she opted to use a different coloured post-it for each hat. In her case, we had colours for Development Features, Development Issues, Customer Support, and Investments. Investments are the items that have a lot of value in the long term. Now, Nancy could write out all of her work. She looked through her emails, documents, calendar and mental notes to identify everything. The dump process took about 30 minutes. Have a purpose for the board. We also made an explicit goal for the first week, and posted it beside her workflow. In the first week, it’s all about incorporating new daily habits, and building awareness, namely to visualize all work. This means not working on anything that isn’t already on the board. I recommend anyone getting started to have this as their first goal. We also discussed what that means in daily life, to increase odds of success. She agreed to begin each day by updating her board before starting into work. We also placed the board directly behind her desk, so it’s in plain view and easy to access. It’s hard to ignore. Sticking with it. Often I recommend adding a daily habits tracker to the board, to make those intentions more explicit, to measure progress and to learn how to be successful through experimentation. I’ll explain more on this in an upcoming post. With Nancy, we opted not to, partly because I work right beside Nancy so my presence creates accountability and we usually checked in at the start of the day. Since I can’t be with you at your office (sorry! ), you might want to try the daily habit tracker trick. Once everything was in place, Nancy was pretty excited, though a bit overwhelmed by the vast number of post-its on her wall! That’s normal, even expected when seeing for the first time everything that she was trying to manage. At least now she felt more confident that something important wasn’t going to slip through the cracks. Creating a board using the recommended workflow. Deciding on what she wanted to visualize most, and used colours to support that. Next time, we’ll see how Nancy’s first week went, what she learned about her work and where she went next. We’ll explore the power of retrospectives and goals to drive improvement. I like systems and this is a thoughtful and sound starting point. I, too, "wear many hats" and need to prioritise without getting distracted, which is so easy. Your welcome Sue. Will you come back and share results of your experiments with Personal Kanban? Gerry, this is a great starting point and framework for managing a large and growing workload. I plan to use software to implement it this month. Great Michael, will you come back and share your progress with us, so we can learn from your experiment? Brilliant article. Thanks for sharing. Your welcome John. What resonates most with you? Thanks for nice info, I would like to visit again to your website. I started using your training with the Kanban System in late January 2014. Changed my life and then my life changed more and I lost my way. A family member became very sick and everything went out if control. 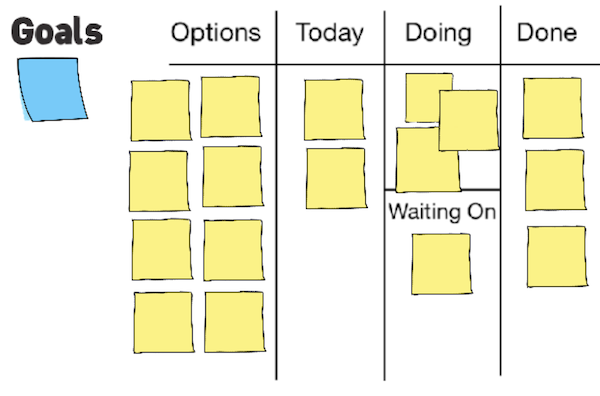 What little sanity I retained was because of my Kanban boards. My business suffered, my house has become a disaster, our meals have become non-existent. Lately I have not even been able to do items like “Pay Bills”. 2 days ago I took one Kanban board and gave it priority. I put it in micromanagement mode with a minimalist focus. I could not stand to see All the things I needed to do. I allowed myself to only pay 1 bill, write 1 report for my business, plan and eat lunch and take a nap. Then I spent an hour just sitting with my family in the evening and I went to bed early. Still ate no supper and have a house that is overwhelming but it is the best sleep I have had in months. Just lowering the expectations on myself is all I really did for this first step. Great article, Thanks for sharing the great info. Thanky so much. Great info. Thanks for sharing. If wish to visit again on your blog. Nice post. keep it up. I would like to visit again to your website. It is great article.Thanks to sharing with us.I like to visit your website again.Nice work. Living a purposeful life means that someone has a goal in his life, he is taking forward steps to achieve that goal. The education is a step to achieve the goal. Liberal education means the education which has no restriction no bindings of any institution or curriculum. It will encourage the personalization, mental, cultural development. The lesson of this education system is called language mainly. Nice and amazing one dear. Keep sharing. Really great tips, waiting for next part. Staying happy and fit in the life for longer time is a great ask. I often find it harder, and I believe just like me many people also finding it harder. However, here provided 5 steps seems to me quite interesting to make the life happier. I'm delighted to learn such tips and will wisely try these out. Wonderful and amazing one dear. Good job, Interesting article thank you so much for sharing bro. Amazing one dear. You are doing very well. These steps will help those people who really wants to be happy and spend quality time with their family. Nancy would be earn what he want from this if he follow the guidance.